Bottled water companies are taking what’s ours to begin with, packaging it in a lethal way, overcharging us for it, and asking us to pay for the recycling. All they’re really doing is selling us this convenience, which is actually highly inconvenient. It is no secret that we live in an era of convenience. Instacarts and Doordashes can provide us lunch with the touch of a button. Walk into any Starbucks and count the deluge of customers willing to pay $3.45 for a coffee rather than make one at home for less than 30 cents. If you're in this category, and we all are from time to time, allow yourself a moment to people watch while you sip in that comfy chair. Count those in line who had even slightly anticipated a daily caffeine craving and brought a refillable container with them. Then imagine everyone else, the overwhelming majority who depend on this take-&-toss lifestyle without second thought. The trash cans pile up. I decide to walk outside. In the past year, I have tried to learn all I can about the profiteering industry that is Big Plastic, a subsidiary of Big Oil. Plastic is a petrochemical byproduct of the unusable oil forms that we extract out of the Gulf of Mexico. The same byproducts that are related to the BP oil spill and refinery plants that cause cancers in nearby low-income communities. Fleece, emergency water bottles, engines covers, wheel inflation caps, and computer casings are all examples of the wonderful uses of the synthetic creation. But every year, global manufacturers produce more than the human biomass of plasticcombined, and the vast majority of it is unnecessary. Big Plastic’s swath of culpability over health, environmental, and social justice issues is why I combat its production with deliberate non-consumption in all forms. Consider me an anti-plasticist. My partner Kevin is a willing participant. Strolling through the produce section of Rouses left me exceptionally baffled. Almost all things natural, from cabbage to carrots, were covered with the familiar, clear gloss. Who makes all this stuff? I remember reading that every ounce of plastic that has ever been created still exists somewhere in the world today. In landfills, in streets, in parks, in oceans, in fish, in us. Did you know when exposed to heat, plastic becomes hormonally activated and can disrupt our endocrine systems? Imagine our post-consumption version of these neatly organized shelves replicated across the 37 Rouses stores between Alabama and Louisiana. Then expand this across every grocery chain in the world. When you combine the typical household’s improper waste management with this plastic unanimity, we have a literal clutter$%*@. Escaping plastic purchase as a consumer requires strategy and commitment. To engage is to swim upstream through a toxic gauntlet of processed preservatives, soon-to-be-diabetic drinks, and tauntingly cheap alternatives. (When in doubt, choose glass.) I have failed many a time. Bringing my own backpack or reusable bags to the store would not suffice. What continually irked me throughout this discovery process was the tyranny plastic held even over my staple diet of rice and beans. Things like Mahatma, Goya, La Canderita (corn tortillas), and Roman Meal (wheat bread). I could not leave the store without directly supporting landfill growth. Every week I carried plastic proof to show for it. To score some storage containers in a pinch, I highly recommend Freecycle.org (create a posting for mason jars wanted), Craigslist (free section), or Goodwill. Goodwill typically sells its reusable containers between 30 and 60 cents. I began collecting whatever I could...an old Couscous tub, a ziploc bag, a Bloody Mary jar from work, two Tupperwares, and a cereal storage bin that reminded me of the one in grandma’s kitchen. With my new acquisitions, my first thoughts were to bypass Whole Foods altogether. (Our budget simply did not allow for $20 quinoa purchases.) I walked into Rouses with a backpack full of containers, a bit nervous. As expected, the bulk section was filled with plastic bag dispensers. When I asked the customer service representative how I could use my own containers, he said, ‘You can’t. Just buy with our bags and then transfer it over when you leave.’ He walked off shaking his head, murmuring frustratedly under his breath. I wanted to smack him like, "Wake up!" Moments like these are what I refer to when I talk about swimming upstream. Our systems of consumerism are designed for folks to be inconvenienced when we voice to act sustainably. Someone is profiting off our unconscious use of plastic bags everyday. Meanwhile, our ocean life perishes. I left Rouses discouraged and empty-handed, feeling like me trying to do the 'right thing' was an annoyance to this young man trying to do his job. That was enough for the day. 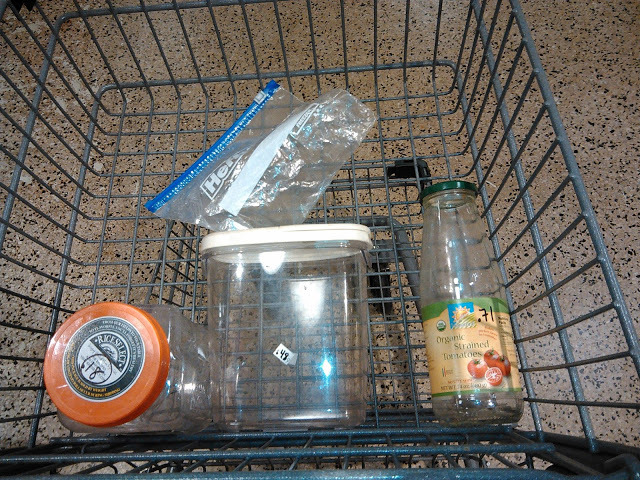 After two days of sulking, I collected more jars, rebuilt a resolve to cut ties from plastic, and biked to Whole Foods. When I asked if I could weigh my containers as Trayshon promised, the staff were extremely affirming and helpful. I felt naughtily counter-cultural rolling up to the cashier with a stash of mis-matched, empty receptacles. After every scale reading, I penned in the decimals with a growing optimism. I am one-step closer to aligning my beliefs and consumer practices. It was time to stroll over to the bulk section and stock up. The satisfaction of scooping from those once-elusive barrels of beans and grains was divine! I dropped a few chickpeas on the ground by mistake, felt their distinct texture between my thumb and forefinger, and recalled the slippery sensation of grabbing chickpea-filled plastic bags off the shelf. Never again. So here they are: a salvaged couscous jar filled with brown rice, cereal bin of black beans, Bloody Mary glass of red lentils, Tupperware of chickpeas, and ziploc bag full of quinoa. My motley crew of containers held out! All of this I squeezed carefully into my backpack, after receiving a $2 discount for bringing in my own containers. Walking out of Whole Foods this day, the windiest cold-front would blow me off my bike before it could wipe the smile off my face. The total cost me less than 20 bucks, and even if I could get the same quantity from Winn Dixie for $15, it wouldn't be the same. After this experience, I know I can only buy bulk from hereon out. Rouses, your store manager better be ready next time. I'm calling you out. Stay up for more of my trials navigating the system sustainably. We can never let convenience substitute for our consciousness. It feels like Groundhog’s Day. Same system, same selfishness, same skintones. After temporarily breaking free from my group, I had the fortune to meet several members of the Global South who, unfortunately, have also been impacted by the insatiable, environmentally devastating routine of Global North’s capitalistic dominion. Ranatha and myself, after an engaging conversation on capitalism and displacement. Here is Ranatha. She represents the Samaaka Maroons, a population of West African descendants who were shipped as slaves to Suriname (under Dutch occupation) during the 16 and 1700s. Only 250 years ago, they fought for and eventually received freedom, only to be released into the unfamiliar bush of Suriname wilderness, where they were received by indigenous tribes to live off the land. For centuries, the Samaaka Maroons have been ‘keepers of the forest,’ Ranatha explains. But in this day, these very lands in which they were freed, have been sanctioned for corporate abuse by the government to contaminate water and soil, and irreversibly wipe out forests at an increasing rate. At COP21, Ranatha is speaking to me, frustrated. She’s frustrated that a conference about climate change still does not value indigenous people’s presence. ‘Who else is more impacted than us?’ she argues. The Samaaka Maroons currently have no voice aside from her cubicled presence at Le Bourget. In 2007, the Inter-American Court of Human Rights passed a bill stating the government of Suriname must recognize the land rights of the Samaaka Maroons...but to this day, nothing has happened. Suriname, like many areas of the Global South, is abundant with natural resources, including gold, exotic wood, aluminum ore, and oil. To remove gold, high pressure hoses saturate the ground beneath the surface. Soon after, lethal mercury of both liquid and gas form is administered to separate gold from the other minerals. Rivers where the Samaaka Maroons used to bathe are now tainted yellow with mercury runoff. As more natives are poisoned out of the lands, they are simultaneously funneled into the proximate path out of poverty: this extractive mining economy. When earth-dependent communities face the environmental contamination of capitalistic creep, they often have no choice but to cave. Or perish. I try to connect the dots. I’ve seen a similar procession before. In South Louisiana, land loss from sea level rise, oil drilling and spillage displaces Houma and frontline natives. In the Bahamas, Biminites watch chain cruise line developers pillage their mangrove wetlands. In Mali, subsistence farmers migrate to cities as multinational agribusinesses force them off their ancestrally-inherited land. Earth bleeds. The virus is everywhere. I wonder if we have it in us to connect the dots. I wonder if we understand that when we destroy the last keepers of the forests, we will have destroyed our species' salvation. There is a wound. so deep and infected. Were taught how plants like camomile protect us from indigestion. and touched tree bark and the smelled the moist of the mud? Did you know we spend over 7 hours looking at a screen? That’s in a day, and it’s increasing, which can’t be good. When for one third we’re supposed to be sleepin. we forgot to visit, then forgot to support the clinic. Football fields of forest uprooted each day. now its parrots flee their cindered homes in disarray. But if our greed trawls all the fish out the sea, can they respawn? but sees her cancer isn’t retreating. It’s in us. Can’t you see it. An influx of industry, grown in excess. Football fields of forest toppled each day. to complete a cycle that makes Her weak. so they can reach the protein quotas westered doctors ordered. What’s vested in our selection for slaughter? merciless we are, says the rest of biota. Football fields of forest mangled each day. in this American dream, I wake to see the land of debris, and home of the slaves. package our harvest with war-causing byproducts. u best bet when Earth breaks to shake us they’ll be the first to jump ship on rockets. And where will you be? to end global warming while eating methanating bodies, I call hypocrisy? You and I, we gotta see interconnections of our system. Because downstream from our purchase flows septic murder of the victims. while companies monitor revenue off the corpses of the living. And we’re all guilty, but we can all make a difference. If our hearts open up, our world’s crying, can we listen? So when I think how we get out of this position. in what ways have I been conditioned? To move at will, to strive with confidence. To dream with a real expectation of achievement. but here, the cement is cracked. like weed growing to feed the kids. that C is what he really needs, though it's none of the above. A term used for an outsider who settles in Bimini. Seaweed comes, seaweed goes. Some stay to nourish the land (seaweed is a natural fertilizer), and others wash-up for moments before getting swept out to new destinations. Honestly, I can't blame the overt or subtle repulsion towards outsiders on the island. Tourists arrive with extravagance and dispose of US-brought goods as trash before thrusting their tri-engine boats--overstuffed with Bahamian harvested seafood--back home. "Bimini needs us, otherwise they wouldn't be asking us to buy things from them." "I need a weekend getaway from Miami, but I don't want to lose the perks." As a fellow species of seaweed, I would like to be of the nourishing type that can be put to use. That vegan sushi roll type of seaweed. Seaweed will surely return, but for now it is gone with the currents.